Understanding chemical and nuclear properties of superheavy elements. and challenging subjects in both chemistry and physics. How many chemical elements can exist and can be produced? How long can they live? Which properties determine their stability? What are their chemical and physical properties? How well do their chemical properties follow the Periodic Table? And how are their orbital electron configurations affected by increasingly strong relativistic effects? These are some of the most fundamental questions in science. 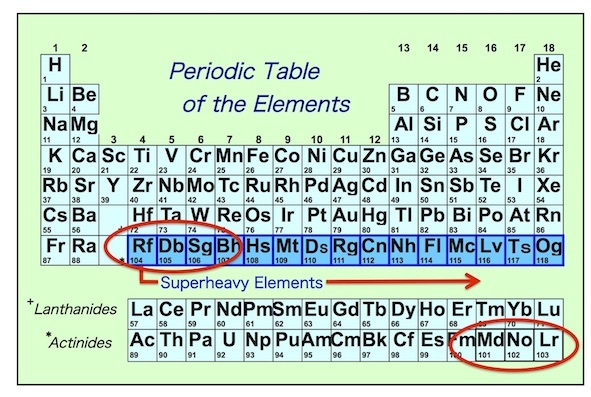 The main objective of this group is to understand chemical and nuclear properties of superheavy elements (SHEs) placed at the uppermost end of the Periodic Table and on the heaviest frontier of the nuclear chart. each atom produced decays before a new atom is synthesized. This means that any experiments to be performed must be done on an "atom-at-a-time" basis. Thus, rapid, very efficient and selective experimental procedures are indispensable to isolate the desired properties. redox potentials, ionization potentials and compound formations. and through the evolution of nuclear deformation at the highest proton and neutron numbers.